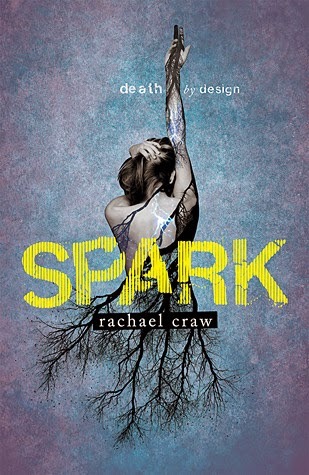 I have been the victim of a terrible reading slump for the past three weeks, but it all ended when I picked up Spark. This book was exactly what I needed to pull me from the depths of my shameful reading slump. After starting and abruptly putting down several books, I decided that I needed something exhilarating and intense, something that would grab and keep a hold of my interest. That is exactly what I found in Spark. The entire premise of the story had me intrigued from the very first page. I mean, DNA modification used for private security but then gone wrong? Count me in! The topics of people with abilities and modified DNA are two of the things that really seem to fascinate me. The entire idea of The Affinity Project, Shields, Sparks and Strays absolutely blew my mind. It was such an incredibly unique concept THAT I found it to be quite refreshing. The world-building and the back story of the Affinity Project was extremely in-depth but at times the new terms and jargon threw me off a little bit, and I was left a little bit confused. Not too much that I didn’t figure out eventually, though. I do appreciate the attention to detail that went into the backstory, and it was set in a way that made it seem totally plausible. Every element was explained properly, so there wasn’t the information overload that tends to plague a number of YA science fiction novels. Evie was an incredible main character, there is no denying it. If there is one word that I would use to describe her performance throughout the novel it would be: genuine. I felt like her reactions to the circumstances were quite realistic for a teenage girl, and when they were a little bit extreme, I could understand that it was the influence of her modified DNA. It was wonderful to watch her develop as a character and grow as a person as she learnt to control her new abilities and use them to her advantage. But what I loved most about Evie was her loyalty and ever-present concern for the safety and well-being of those around her. I think this was incredibly effective because though she may have viewed herself as not being completely ‘human’ anymore or as a ‘mutt’ she retained these beautifully genuine human traits. The complicated nature of Evie’s relationships with the Gallaghers and especially Miriam, were wonderfully done and really set a realistic tone to the novel. Evie’s relationship with Kitty was also very well done, and I was constantly in awe of her loyalty and protectiveness over her best friend. I wish I had a best friend like her! Oh, and we can’t forget about Jamie. Oh lord. That boy had me feeling some sort of way. His relationship with Evie, though it had its many ups and downs, felt very genuine to the situation and played a large factor in my love for this book. The intense action and exhilaration that I had been craving were definitely there and they were beautifully done. Though there may have been a couple of slow spots, those were largely outnumbered by the mind-blowing plot twists and highs. There were some plot twists that had my hand over my mouth in pure shock, and I was turning the pages so quickly that If I hadn’t been reading on my kindle but a physical copy, the pages would have ripped right off. The mystery had me hooked from the get-go, and I was second guessing every character I came across in suspicion. Spark had me hooked from the very beginning. It pulled me into it’s pages and put me in a constant state of anxiety while also providing me with intense and exhilarating action (and emotional exhaustion). I am filled to the top with love for this book, and I can confidently say it is one of my favourite YA sci-fi reads of the year. A massive thank you to the author herself, Rachael Craw, for recommending it to me on twitter and getting me out of my dreadful slump! I can’t wait to see what comes next, I’ll definitely be counting down the days until the release of Stray! If you haven't already read this one, I definitely recommend that you do!